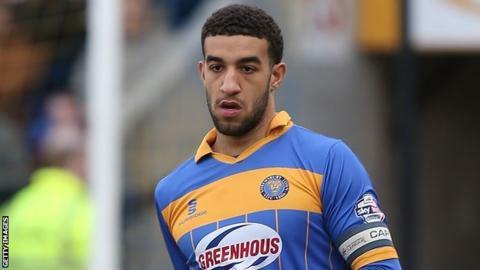 Connor Goldson scored two first-half goals as Shrewsbury beat Dagenham & Redbridge to keep pressure on League Two leaders Burton Albion. The visitors dominated the early stages before Goldson headed in a Liam Lawrence corner on 17 minutes. Shrewsbury began to take control and doubled their lead five minutes later through another Goldson header from a Lawrence free-kick. Dagenham responded well after the break but the hosts held on for the win. This was Shrewsbury's fourth win in a row and it came as a boost for Micky Mellon's second-placed side as they reduced the gap at the top of League Two to one point after Burton drew 1-1 at Plymouth. Despite Daggers keeper Mark Cousins making a string of fine saves his team were unable to claw back the two-goal deficit after a bright start. Dagenham drop to 16th in the table after Oxford United beat Wycombe to leapfrog Wayne Burnett's side. "We had a very bright start. We passed the ball very, very nicely and we worked incredibly hard on their shape. We were certainly the better team for the first 18 minutes but then gave goals away. "It's disappointing that we've given them goals, because we haven't marked and it's about game management. "If I took you into our changing room now you would see the level of detail given to players. They are told, they are shown, they are explained to. But if you don't have players picking people up what else can you do apart from physically go on the pitch and put them in the right position." Match ends, Shrewsbury Town 2, Dagenham and Redbridge 0. Second Half ends, Shrewsbury Town 2, Dagenham and Redbridge 0. Andy Mangan (Shrewsbury Town) wins a free kick in the defensive half. Foul by Andre Boucaud (Dagenham and Redbridge). Foul by Tyrone Barnett (Shrewsbury Town). Andre Boucaud (Dagenham and Redbridge) wins a free kick in the defensive half. Joss Labadie (Dagenham and Redbridge) wins a free kick in the defensive half. Substitution, Shrewsbury Town. Josh Ginnelly replaces Bobby Grant. Connor Goldson (Shrewsbury Town) wins a free kick in the attacking half. Foul by Mickey Demetriou (Shrewsbury Town). Alex Jakubiak (Dagenham and Redbridge) wins a free kick on the right wing. Attempt missed. Tyrone Barnett (Shrewsbury Town) right footed shot from the left side of the box misses to the right. Corner, Dagenham and Redbridge. Conceded by Connor Goldson. Substitution, Dagenham and Redbridge. Joss Labadie replaces Billy Bingham. Substitution, Shrewsbury Town. Andy Mangan replaces James Collins. Joe Widdowson (Dagenham and Redbridge) wins a free kick on the right wing. Bobby Grant (Shrewsbury Town) wins a free kick in the defensive half. Foul by Alex Jakubiak (Dagenham and Redbridge). Corner, Shrewsbury Town. Conceded by Joe Widdowson. Foul by Connor Goldson (Shrewsbury Town). Foul by Bobby Grant (Shrewsbury Town). Andre Boucaud (Dagenham and Redbridge) wins a free kick in the attacking half. Attempt missed. Tyrone Barnett (Shrewsbury Town) header from the centre of the box is close, but misses to the right. Connor Goldson (Shrewsbury Town) is shown the yellow card. Substitution, Dagenham and Redbridge. Alex Jakubiak replaces Damien Batt. Substitution, Shrewsbury Town. Tyrone Barnett replaces Mark Ellis. James Collins (Shrewsbury Town) is shown the yellow card. Foul by James Collins (Shrewsbury Town). Damien Batt (Dagenham and Redbridge) wins a free kick on the right wing. Corner, Dagenham and Redbridge. Conceded by Mark Ellis. Attempt blocked. Andre Boucaud (Dagenham and Redbridge) right footed shot from outside the box is blocked. Ryan Woods (Shrewsbury Town) wins a free kick in the attacking half.